June 27, 2007...Toronto...Ontario... The National Ballet of Canada's Creating Dances Summer Camp returns for its 14th year from July 3 to 13 at the company's studios in The Walter Carsen Centre. 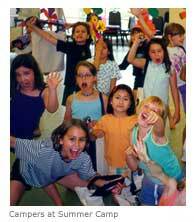 Creating Dances Summer Camp gives up to 50 children, aged 7 to 12, the opportunity to explore creativity through music and dance. Presented in association with Harbourfront Centre, participants are taught by professional dancers and musicians skilled in encouraging creative development. The premise of the camp is not to train children in a dance technique, but to encourage them to explore their imaginations and creativity using the disciplines of dance and music. Campers share their creations with family and friends on the final day of the session. Creating Dances Summer Camp will be taught this summer by National Ballet Second Soloists Alejandra Perez-Gomez and Lisa Robinson, National Ballet Orchestra Principal Violist Angela Rudden and Composer/Musician Edgardo Moreno. To register or for further details, call the HarbourKidsCamp Hotline at 416 973 4093. March 5, 2007...Toronto, Ontario... Tina Pereira, 24, of The National Ballet of Canada and Ulrik Birkkjær, 22, of the Royal Danish Ballet won The Seventh International Competition for The Erik Bruhn Prize on Saturday, March 3 at the Four Seasons Centre for the Performing Arts in Toronto. Tina Pereira began the competition dancing with Keiichi Hirano in an excerpt from Le Corsaire for the classical portion of the competition. During the performance Mr. Hirano tore his Achilles tendon and Ms. Pereira continued on her own. During the intermission Artistic Director Karen Kain made a quick programme change, replacing the planned world premiere of veer by Canadian choreographer Sabrina Matthews with the balcony pas de deux from Romeo and Juliet. Principal Dancer Guillaume Côté, who was in the audience for the performance, stepped in to partner Ms. Pereira. The pair had performed the piece together at a recent guesting engagement. Ulrik Birkkjær, a member of the Royal Danish Ballet's corps de ballet, danced the pas de deux from Flower Festival in Genzano and a new work by Tim Rushton, opus, with Yao Wei. Eight dancers in total from The National Ballet of Canada, American Ballet Theatre, The Royal Ballet and the Royal Danish Ballet competed for the prestigious prize. Each company was represented by one male and one female dancer between the ages of 18 and 26 who danced a classical and contemporary work. Veronica Tennant and Rex Harrington, hosts of the evening, paid tribute to National Ballet of Canada founder Celia Franca, who passed away at the age of 85 on February 19, 2007 in Ottawa. The National Ballet of Canada performed Voluntaries in honour of Glen Tetley who died on January 26, 2007 at the age of 80. The Erik Bruhn Prize is presented by John and Claudine Bailey. The National Ballet of Canada gratefully acknowledges the ongoing support of the Canada Council for the Arts; the Ontario Arts Council; the City of Toronto through the Economic Development, Culture and Tourism Department; The Government of Canada through the Honourable Beverley J. Oda, Minister, the Department of Canadian Heritage, the Government of Ontario through the Honourable Caroline Di Cocco, Minister of Culture.